So, I know this should probably be a post about pie, which I love, or pumpkin pie…which I HATE. I know…I’m a jerk. I like pumpkin things, but never pumpkin pie. This cake is super simple in both assembly and flavor–the batter takes minutes to make and there’s zero special equipment required. Don’t get it twisted though, because even if this is just a chocolate-on-chocolate situation, it is so, so good in it’s simplicity. 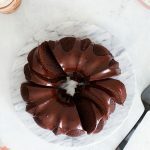 The cake is dark and rich, but not so much that it doesn’t benefit from a glazing of glossy ganache. The crumb is fine and very moist, my favorite. And, I know ganache sounds fancy, but it’s so not…two ingredients, mixed together. DONE. I’m pretty sure this is my new go-to cake. It’s so easy, a little rustic, but pretty. It’s a gem. Makes 1, 8-inch, round cake. 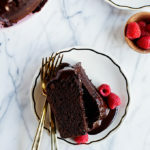 Use your favorite cocoa powder for this cake. I prefer Valrhona because it is rich and dark with intense chocolate flavor. Preheat the oven to 350˚F and spray an 8-inch, round cake pan with cooking spray and line the bottom with a round of parchment. Set aside. In a mixing bowl, whisk together the flour, cocoa, sugar, baking soda, and salt. In a measuring cup whisk together the milk and vinegar, whisk the eggs, oil, and vanilla into the milk and vinegar mixture and pour into the flour mixture. Mix gently with a spatula until just combined. 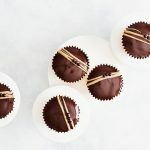 Pour the cake batter into the prepared cake pan and bake in the center of the oven for 35-40 minutes or until a toothpick inserted in the center of the cake comes out clean. Remove the cake from the oven and place on a rack to cool for about 10 minutes before turning out. Cool completely before glazing with ganache. Heat the cream until scalded, when little bubbles form around the edges, add the chocolate, remove from the heat, and cover. Let the chocolate and cream rest for about 5 minutes, until the cream has melted the chocolate and whisk until smooth. Pour warm ganache over the top of the cake. Let the ganache set 10 minutes before serving. I don’t like Pumpkin anything so I’m totes ok with the fact you don’t get down with Pumpkin pie…But this cake.. Have Mercy, that is nothing but Chocolate Heaven. Chocolate Heaven! Let’a go there. Dude I am so over the pumpkin… and SO into this cake. Simple is best, especially when chocolate is involved! YES! I’m glad we agree. Anytime is the right time for chocolate cake! 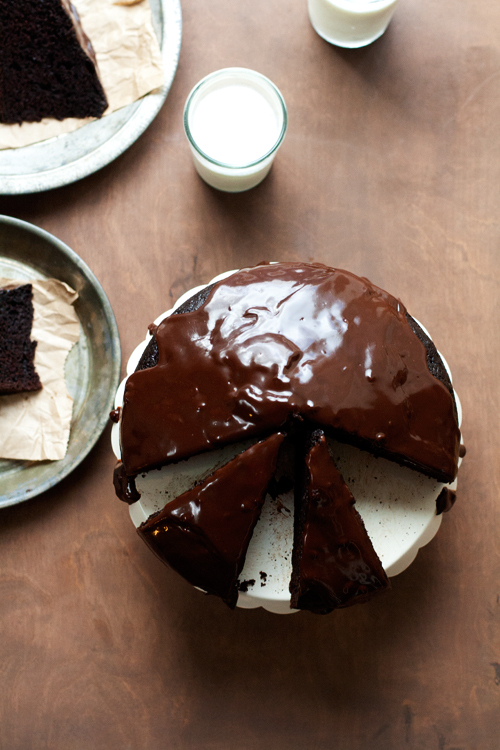 You’re so right, ganache is super easy and oh so good. I’d love a slice of that beautiful cake right now. I had to send this cake to Sean’s office…I couldn’t resist it! Thank gawwwd. I’m so sick of seeing pumpkin and coconut cream and roasted brussels sprouts everywhere. I’m all for eating this Thanksgiving, but we can talk about something else, for sure. This cake is absolutely stunning! Yes! We need a break, for real. Girl, I am ALL over this situation. I’d like to eat that ganache with a spoon! And I’m totally with you on the chocolate cake over pumpkin pie thing – any day! It’s just so easy! Thanks, Averie! 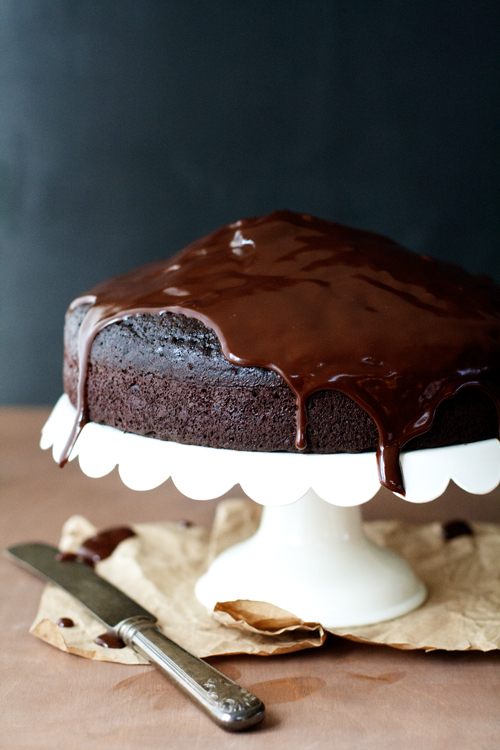 The ganache on this cake is straight up fabulous. Plus, the cake itself looks perfectly moist and delicious! I love pumpkin pie, but no hard feelings…I don’t like bacon which is apparently a sin. My mum used to make a cake just like this – it’s been so long since I had it! I forget how good the classics are. Chocolate all the way!! I will always choose chocolate over pumpkin any day. This is gorgeous! 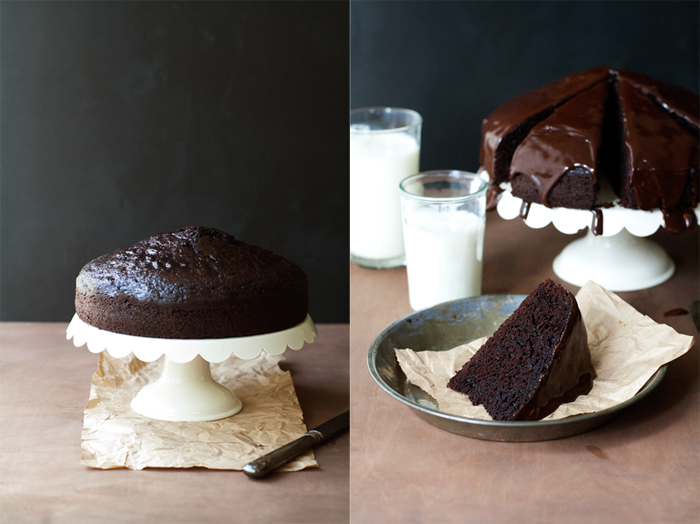 I am totally coveting that gorgeous scalloped cake stand…AND a huge slice of this cake! 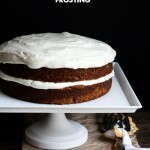 I’ve always had a thing for rustic, single-layer cakes, so this looks to die for! Hey soul sister! I hate pumpkin pie too–let’s form a club and talk about why it’s so goopy and why the rest of the world is deluded. Also, we will eat chocolate cake at all of our meetings, specifically, this chocolate cake, because it looks awesome. Now all we need is a secret hand shake! WOW girl!! This looks just about like the perfect dessert in my book :) Wish I could have a slice. I might need to make this TONIGHT. True story. regarding the leftover cake itself, will the ganache stay moist and “fudgy” atop the cake for a couple of days? Or does it get soaked into the cake? I am heavily considering making this. Such a great looking cake and recipe. Thanks for sharing!! Just the cake itself, well wrapped, could hang out on the counter for a few days. With the ganache, I’d store it in the fridge…but be sure to take it out at least 30 minutes before serving, so it can come to room temp. The ganache is thick enough that it will stay fudgy on top of the cake. Hope that helps! Thanks, Jenna! I noticed that in the list of ingredients you didn’t mention how many eggs to use. But in the directions you did mention mixing the eggs with other wet ingredients. 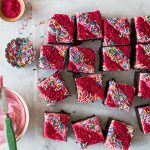 Este es uno de los pasteles que me encantaría hacer con tanta frecuencia como mis ganas de comer chocolate …. cada tres o cuatro días. Una receta verdaderamente valiosa. Gracias. Hi! I am so excited to bake this. Do you have to use vegetable oil? Could I use avocado oil or coconut oil? I think you could use any oil you like, but I would personally go for one that is liquid at room temp to ensure a tender cake :) Avocado, olive, or even a nut oil might be interesting. 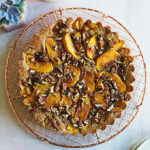 This looks amazing, I am pinning and making this over the coming weekend for a special birthday. I make a similar one layer cake from the KA Flour site and have successfully subbed lemon juice for the called-for vinegar in that recipe. As I have no vinegar on hand, do you think subbing lemon juice in this recipe would provide the needed acidity? (Or, I’ll just get vinegar when I do the marketing) Thanks for such a simple, but decadent treat! I think you could definitely try it with lemon juice. I probably would if I didn’t have vinegar on hand. Thanks, Paula! Why doesn’t the print recipe button work? I can’t even select the type to put it into a Word document. I’m not sure, but will look at it ASAP. Thanks for bringing it to my attention. what a great recipe! I’ve made this quite a few times over the past couple of years and every time it turns out amazing! Thanks for the recipe!!! Thank you for commenting! I am so happy to hear that you like it!